This story first appeared in the 2018 Hail Varsity recruiting issue. If you enjoy this story and want to read more like it, subscribe to the magazine today. quarterbacks the Huskers are looking for has already changed under Frost. It wouldn’t be wise to run an offense that’s a mixture of Oregon under Chip Kelly and Nebraska under Tom Osborne with a modern twist, but have a quarterback better suited to be a pure pocket passer. An adjustment has to be made quickly. Keep in mind Nebraska had to undergo an even more drastic change just three seasons ago. When Mike Riley arrived on campus for the 2015 season he inherited a stable of dual-threat quarterbacks that were not perfectly suited for his pro-style offense. Riley tried to blend his offense to suit Tommy Armstrong Jr.’s skills, but keep the principles of his attack alive. Meanwhile, in his first full recruiting class, he brought in 4-star pro-style quarterback in Patrick O’Brien. Nebraska was also able to bring in Tulane transfer Tanner Lee, who had to sit out the 2016 season. In the 2017 recruiting class, Nebraska signed another highly-touted pocket passer, 4-star Tristan Gebbia. In the span of two seasons, Riley had transformed the quarterback room to better suit his needs. Heading into the start of the 2017 season, Nebraska had Lee, O’Brien and Gebbia as the three scholarship quarterbacks, and the Huskers could hit the ground running on offense. We know how that story ended. It wasn’t pretty, which brings us to quite possibly the number one job that Frost and offensive coordinator Troy Walters have this offseason: reshaping the quarterback position. However, before we look at the work Nebraska’s staff has already done to reshape the room, we need to look at the prototype for what this staff hopes to accomplish. On October 30, 2010, Marcus Mariota verbally committed to Oregon. After redshirting in 2011, Mariota became the starting quarterback his redshirt freshman season and had 3,429 total yards with 37 total touchdowns and six interceptions. In 2013, the year Frost was promoted from wide receivers coach to offensive coordinator, Mariota had 4,380 total yards with 40 total touchdowns to just four interceptions. Mariota played part of that season with a partially torn MCL. In what would be his final season, 2014, Mariota tallied 5,224 total yards with 57 total touchdowns and just four interceptions. What Mariota accomplished at Oregon is simply staggering. His combination of lighting quick decision-making, accuracy as a passer and being lethal with his legs will likely forever make him the prototype for what Frost wants his quarterbacks to be. Mariota, now the starting quarterback for the Tennessee Titans, counts Frost as a friend. Construction of the new quarterback room at Nebraska is already underway. 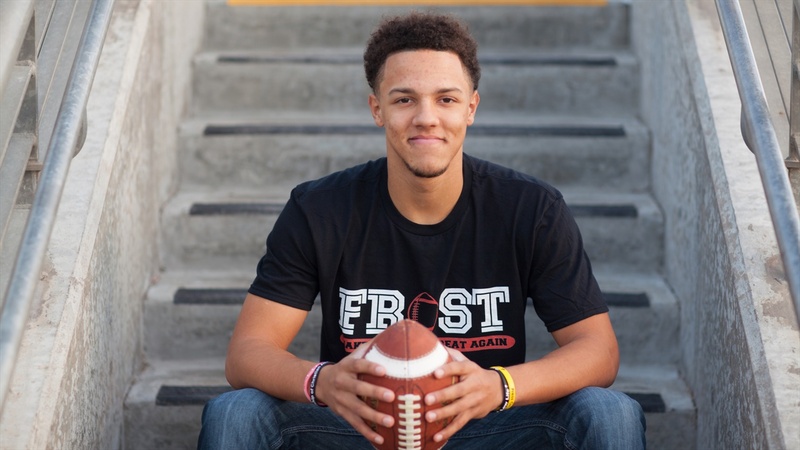 The very first call made to a recruit by this staff was to 4-star quarterback Adrian Martinez. The dual-threat, California signal-caller was a Tennessee commit until Frost and quarterbacks coach Mario Verduzco reached out. Martinez committed to Nebraska on Dec. 13 and is already on campus after enrolling early. Martinez and Nebraska hit it off quickly, but his high school coach George Petrissans said something that should make Husker fans perk up. On Jan. 9, Nebraska added Central Florida transfer Noah Vedral. The Wahoo native will be joining the team immediately but will have to sit this season out per NCAA transfer rules. He played as a true freshman last season at UCF, but he does have the ability to use his redshirt for the 2018 season, and will be eligible to play in 2019. During that redshirt year he will be a valuable member of the team since he’s the only player on the roster that has run Frost’s system. Kearney Catholic quarterback Matt Masker was so prolific in his prep career in Nebraska that he broke many Class C1 records that belonged to Frost. Now he has the opportunity to be coached by the man he surpassed in the record books. A few days after the Huskers hosted a Homegrown Huskers event at Memorial Stadium for potential walk-on candidates, Masker decided to accept a preferred walk-on spot. Under Frost, Nebraska has placed an even greater emphasis on keeping local talent in the state. There are now 15 players that have committed to walk-on this season at Nebraska. In two months, Nebraska has added three quality quarterbacks to the team. Martinez is the highest-rated quarterback Nebraska has landed in the recruit rankings era. Vedral performed well in the time he got play during his true freshman season at UCF. Masker enters the program as a highly-decorated high school quarterback and brings a lot of skills that Frost covets to the table. One of those quarterbacks previously mentioned that was recruited by Mike Riley is still on campus and hasn't gone away without a fight. Gebbia was labeled as a “pro-style” quarterback coming out of high school but to label him as a statue in the pocket would not be fair. Gebbia only ran for 293 yards but that would be largely because he threw for more than 5,000 yards and had 61 touchdown throws as a senior in a spread offense. Gebbia has desirable skill sets for the new head coach. It is possible Frost will not find a new Mariota in this group. It’s much more realistic he could develop another McKenzie Milton. After an average true freshman season in which he started 10 games, Milton (5-11, 177) started all 13 games, throwing for 4,037 yards and rushing for 613 with 45 total touchdowns last season for UCF as a sophomore. Frost is well on his way to reshaping the type of quarterbacks on the roster. Now, the most important conundrum Frost may have in front of him is how to get the type of quarterback play he requires to make his offense work. Who better to lead the way than a former Nebraska quarterback?